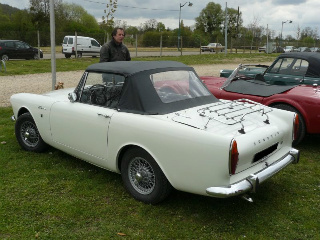 However, after a twenty month production run in which 12,406 units had been built, the Series 4 was replaced, in September 1965, by the Series 5 sports car which would, ultimately, be the final model produced. The most important change in the new version was in terms of the engine, whose capacity was now increased to 1725 cc by increasing the length of the stroke. Furthermore, the original three bearing crankshaft was finally replaced with a five bearing unit, which made it not only sturdier, but smoother running, especially at higher revs. The single twin choke Solex carburettor was now replaced with two Stromberg 150CD carburettors which, together with the increased capacity, produced 92.5 bhp at 5500 rpm and 110 ft/lbs of torque at 3700 rpm. By the time production ended in January 1968, a total of 19,122 Series 5 Alpines had been built. However, even with all these improvements and innovations, it was still no march for its main competitor, the MGB. This was more than borne out by the fact that, in nine years of production, around 70,000 Alpine Series 1-5 were built, compared with nearly 525,000 MGB's produced during an eighteen year period. Although the Alpine offered increasingly comfortable, open top motoring, the one thing it always fell short on was - performance. Even as early as 1961, Rootes Group had been considering ways in which performance could be increased. In fact, the Rootes development team had been given an unequivocal directive that any alternative engines had to fit with the minimum of alterations to the body. 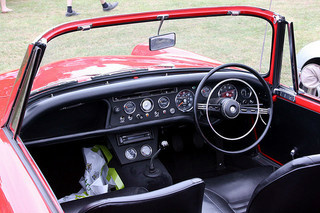 Consequently, two frontrunners included an Alfa Romeo, 4-cylinder, 1600 cc engine, and the Daimler 2.5 litre V8 unit as used in the Daimler SP250 Dart. However, in the end, neither engine was found to be suitable. It is interesting to note that the racing driver Jack Brabham suggested using an American V8 engine which, initially, did not receive a favourable response from Rootes. 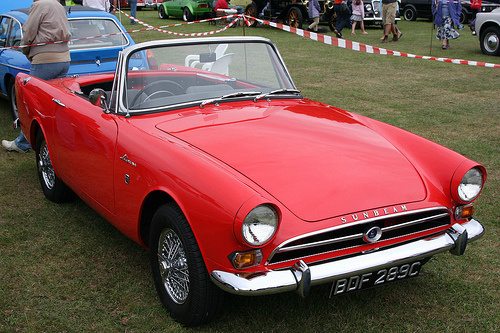 The Series 5 was exported almost exclusively to the US and, in essence, formed the basis for the introduction of the V8 Sunbeam Tiger. Further, in late 1966, Chrysler completed their takeover of the Rootes Group. Initially, they wanted their own V8 engine to replace the Ford unit that powered the Tiger at that time. Unfortunately, this did not materialise, and so Chrysler stopped production of the Tiger and, ultimately, the Alpine as well. Although the name Alpine was used on later cars, these bore no relationship to the classic sports cars built between 1959 and 1968. 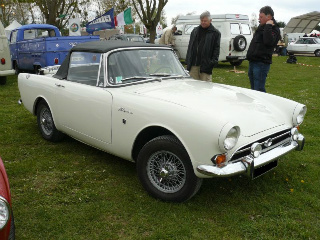 A 1965-68 Sunbeam Alpine Series 5 in good condition would fetch in the region of £4,000/$7,000 to £6,000/$10,000.